The rhinoceros hornbill (Buceros rhinoceros) is one of the largest hornbills, adults being approximately the size of a swan, 91–122 cm (36–48 in) long and weighing 2–3 kg (4.4–6.6 lb). In captivity it can live for up to 90 years. It is found in lowland and montane, tropical and subtropical climates and in mountain rain forests up to 1,400 metres altitude in Borneo, Sumatra, Java, the Malay Peninsula,Singapore and southern Thailand. 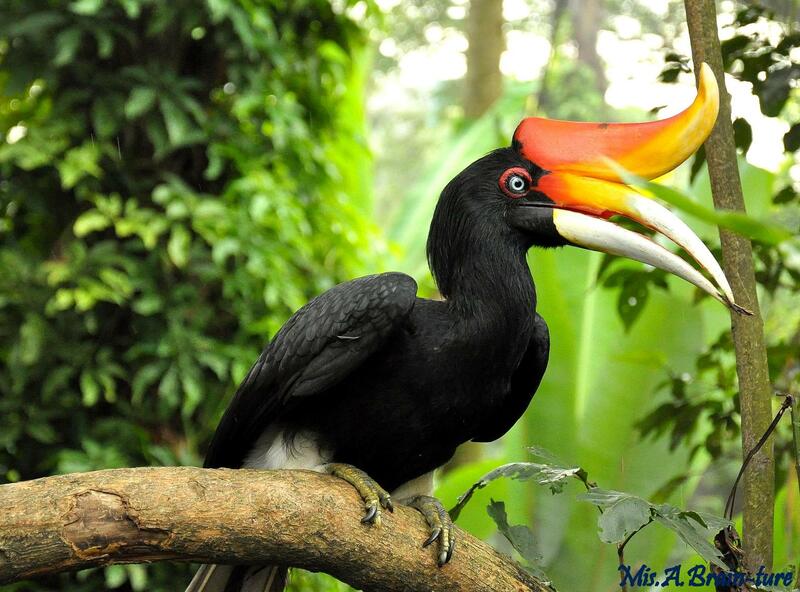 The rhinoceros hornbill is the state bird of the Malaysian state of Sarawak. Some Dayak people, especially the Ibanic groups, believe it to be the chief of worldly birds or the supreme worldly bird, and its statue is used to welcome the god of the augural birds, Sengalang Burong, to the feasts and celebrations of humankind. Contrary to some misunderstandings, the rhinoceros hornbill does not represent their war god, Sengalang Burong, who is represented in this world by the Brahminy kite.